The Kingdom of Saudi Arabia is hurting. Their move of increasing oil production with the goal of lowering prices in order to gain a larger market share (Saud denies this but they are trying to put US shale out of business – low interest rates in the US have contributed to staving off the death blow, for now) has hurt all net oil exporting economies worldwide, including Saud, itself. The secondary effect was to pressure Russia into leaving Assad to the jackals. Russia bit the bullet and did not yield. Strike two. The war in Yemen as well as the financing of Syrian rebels costs the kingdom a lot of money they just don’t have. Steeeerike three. Oil represents about 80% of Saud’s revenue. With ISIS competing for market share by selling oil to Turkey at $20/barrel – thereby undercutting the market by half, their economy can simply not withstand this price point for much longer. So what can they do? They could find other sources of income, they could cut output of oil, they could de-peg from the US dollar, or they could start selling oil in yuan. Remember what happened to Saddam Hussein when he tried to sell his oil in Euros. Everybody was a loser in that affair. Today, the renminbi (yuan – for all intents and purposes) will likely be included in the IMF’s SDR basket of funds. There is an OPEC meeting this Friday. Saudi Aramco is rumoured to be going public, that is to say, privatized. An IPO is being considered. Of course the Saudis wouldn’t let this corporation fall into the wrong hands (5% for now,) so is this simply a variation on a stock-buyback scheme of epic proportion? This way they can raise their stock price without raising the price of oil. Since doing so would hurt the stock price, this would more or less guarantee low oil prices for a while. This would be a bad thing for all oil net exporters; Canada will be especially hard hit. One wonders if they will allow Yuan transactions for their shares. While the world was busy watching the aftermath of the Paris attacks, the IMF just gave its recommendation to place China’s Renminbi in the global Special Drawing Rights (SDR) basket of funds. This puts pressure on the faith in the US dollar and its world reserve currency status and has many international consequences, as well. Today is the day. Is the beginning of the end nigh for the US dollar? With the Fed expected to raise interest rates in December, more outflows from the US dollar to the Yuan (renminbi) and some downward pressure on the dollar can be expected in the short term. Long term, the dollar still looks strong, but the renminbi is set to catch up. It’s official, the yuan will be part of the SDR basket starting Oct. 1, 2016 with a weighting of 10.92%. Could this be a catalyst for portfolio re-allocation? If it is, and if new buyers of yuan stem the outflow of capital from China, the yuan may soar undoing all the devaluations to date and, ironically, hurt the already faultering Chinese economy. Could China’s hard landing turn into a crash? American Imperialism is alive but perhaps not so well in the middle-east. There are many stories about the region and its mind-boggling complexity in the news these days, but there doesn’t seem to be any over-arching analysis of the entire situation which stretches from the Crimea to the Yellow Sea. The big picture is frightening in scope and potential. The UN just lifted crippling sanctions on Iran. The lifting of sanctions would clear a path for Iran to re-purpose its nuclear industry. Iran just discovered uranium reserves within its borders. 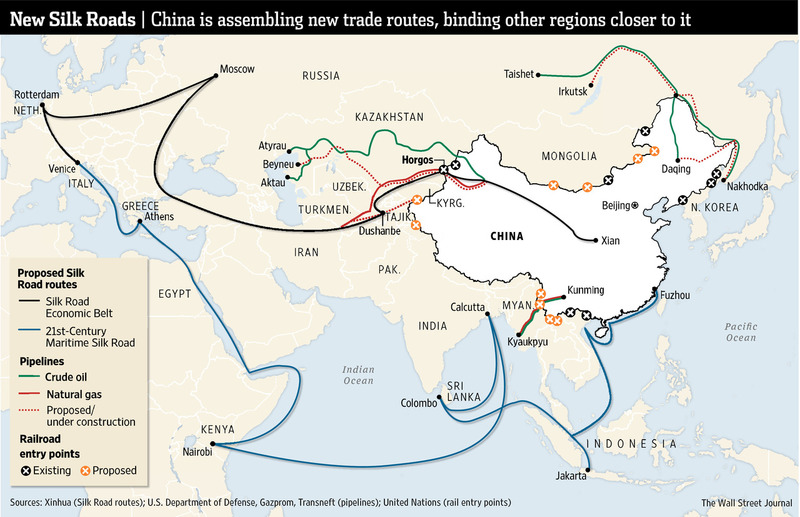 China wants to build a ‘new silk road’ overland through the middle-east to the Mediterranean; the only way through is Iran. China is also building a high-speed rail line to Russia. Most of the pipelines which ship Russian oil to Europe run through the Ukraine. Ukraine’s gas interests are controlled by US companies. Ukraine’s gold was flown to the USA right after the coup. Ukraine wants to join NATO and has permitted them access to Russia’s border. The US has nuclear weapons in Poland and Germany, with 20 more coming. Despite this, Germany and France have abandoned the US position to ‘punish’ Russia. Putin supports Syria and has accused the west (USA) of fomenting trouble in order to dominate both the middle-east and the Ukraine. Syrian refugees are flooding Europe. Assad blames the west for the refugee crisis. Assad gives interview to explain his position. Putin has accused the west (USA) and its allies of supporting ISIS/ISIL and Syrian rebels. Evidence suggests that it was the rebels, and not Assad, who used chemical weapons. The west has demonized Putin. Putin gives speech at the Valdai club lashing out at the USA for destabilizing the world. Russia dumps and burns food from the west because it contains GMOs. Syria has a Russian naval base at Tartus which has just been visited by a Chinese warship. The Israeli Golan Heights were once part of Syria. Israel has granted oil drilling rights to US interests in the Golan Heights and wants to push the border back even further. Israel has discovered enormous gas reserves in the waters off the coast of Gaza. Europe considers a boycott of Israeli banks over the Palestinian settlements. Israel has (unofficially) admitted to having some eighty nuclear weapons. Saudi Arabia doesn’t maintain diplomatic relations with Israel, although both are US allies. The US-Saudi petro-dollar arrangement is one of the pillars of the US economy. Most of the pipelines which ship middle-eastern oil into Europe run through Turkey. Turkey also controls the waters of the Euphrates river. Conflict between Turkey and local Kurds has escalated. The Shia rule Syria despite being a minority, and the Sunni majority rule Saudi Arabia. OPEC has been increasing oil production in order to drive prices down, eliminate competition, and increase its market share. China, Russia, India, Brazil, and South Africa have put together a bank called the BRICS. Efforts to destabilize BRICS countries and bring them into line has led to manipulation of many markets including gold. China wants the Renminbi in the IMF’s SDR basket and is vying for global reserve currency status. The US does not want to lose its status as the global reserve currency. The US has been ramping-up its military presence in Africa. China has been gobbling-up African resources. The Chinese and Japanese economies are inter-dependant and the US has a lot of influence in Japan. The US does not want Japan to join the AIIB and start trading in Yuan rather than Dollars. Relations between Japan and China are tense. Japan disputes China’s claim of islands in the South China Sea and the US warns against militarization. The Japanese economy is teetering on the brink of collapse. Both the Chinese (shadow banking) and the US (over-valued stock) economies are fragile. China, Russia, and the US have been accusing each other of aggressive cyber espionage and are enjoying tense relations. Western banks have been caught rigging markets, and disaster capitalism seems not to be a solution to the problematic future of the world. Supressed evidence suggests that Russia was not to blame for the destruction of flight MH-17. The terms ‘economic crash’, ‘world war III’, and ‘Armageddon’ have rarely ever been so prevalent in the news. Upon further reflection, the rest of this article will be left to the reader’s imagination. However, the main takeaway should certainly be the fact that this quagmire in Asia has (to a large extent) been engineered to protect the US Dollar. It may not work out that way, in the end.